Performing mind reading — and it is a performance — is something anyone can learn to do, and it's simply one of the skills honed in the discipline of mentalism. The object of mentalism is to always have three separate ways out of the trick. What this means is that you will have three potential options and a way to get them all right. There is no way you will fail because the outcome is predestined. 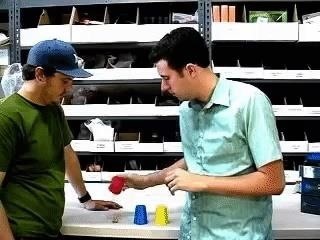 To help you convince your friends, family, and even strangers that you're a mind reader, we've transmogrified a video tutorial from Chris at Magic Geek (now called Vanishing Inc. Shop) into step-by-step instructions for a simple cup trick. 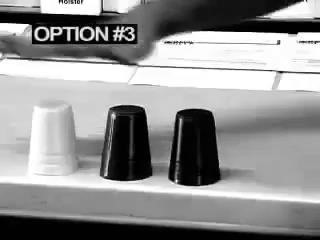 In this trick, your victim hides a dollar bill under one of three cups without you looking, and you use your "mind-reading" powers to find it. This is different from a shell game, which is a gambling game perpetrated by con artists. For the full video guide, make sure to visit the end of this bar tricks how-to. "Mentalism is a trick, or should I say, a set of 40 tricks, designed to fool an audience into thinking the performer has mental powers," says mentalist Angelo Stagnaro. Stagnaro, who is also the editor of Smoke and Mirrors, the largest online magazine for professional magicians, says his craft involves "emulating what non-magicians would call telekinesis, telepathy, ESP, and precognition." Instead of sleight-of-hand or optical illusions, mentalism emphasizes intuition, distraction, and (mis)leading your audience or victim, although those other elements can support a mentalist's repertoire. 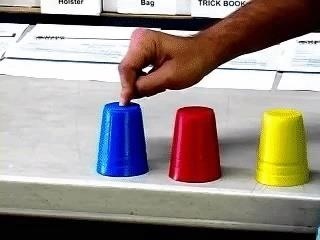 The premise of this reversed shell game is simple. 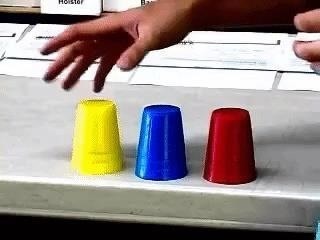 It hinges on explaining your trick to your subject in an ambiguous way, such that you give yourself enough options to look like your trick was successful, no matter how it actually ends up going. So it comes down to you being in control of your body language throughout the trick, and convincingly selling your reaction to each stage of the trick — whether that involves nonchalantly moving on from an unspectacular outcome, or strutting when you're about to land the trick. 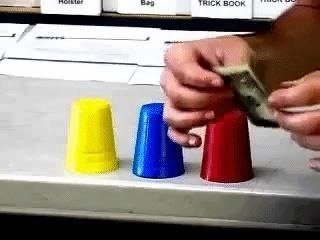 To start off, you'll need a market, normal dollar bill, and three different-looking opaque cups (it's not going to be very exciting for your audience when you pick the cup hiding the bill if you can see it through the cup). 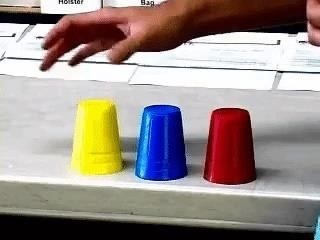 You then pick up the third cup, after slyly rearranging the cups so that the last one is in the middle, to reveal the bill with "I'm under the middle cup" written on it. Shock and awe ensue. And really, it's only a matter of time, because it doesn't matter where your victim hides the bill — one of those three outcomes will occur in this trick. 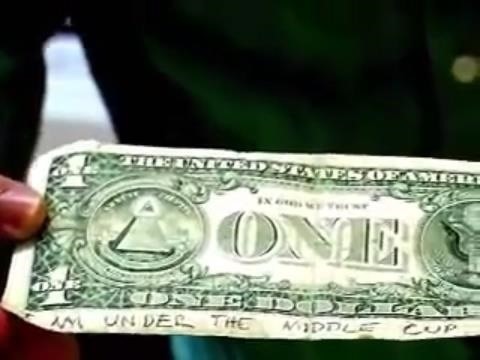 Take a regular dollar bill and write "I'm under the middle cup" (or something to that effect) on one side. You can get as creative as you want with this, but make sure that the marker you use is faint enough that the text can't be seen on the other side, or the trick won't work. In the majority of cases, this is going to be "the prestige" of your trick. You want the text to really get a reaction by making it seem as though you not only made the words magically appear on the bill but used a Jedi mind trick on your victim and made them put it under the middle cup. 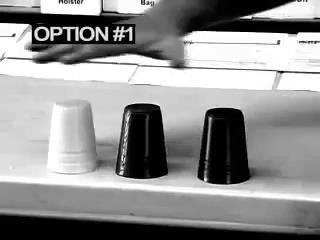 In the video, Chris also suggests the text "I made you put this under the middle cup." First, fold the bill so that the writing is hidden on the inside, put it in your pocket, then find a willing subject for your trick. When you take the bill out of your pocket, present both sides of the folded bill, then unfold it with the text facing you. Combined, these two steps will make most people feel like they have checked the bill enough for it not to have been a specially-prepared prop. Don't make a big deal out of this step — the tone you're going for is nonchalant, like it's oh-so-obvious that the bill is normal and that both you and your victim just want to move on already to the trick proper. Crush the bill into a ball, being careful to keep the text hidden on the inside so you don't give the trick away. Place the three cups mouths down on the table in a row, and hand your victim the crushed paper bill. Tell them to hide it under any of the cups and move the cups around however they please while you look away, but don't make any promises about what you're about to do. This leaves you open to either impress them no matter what happens. Don't worry about your lack of a preamble. People are used to magic tricks having lots of instructions, and they will be willing to wait a while to find out what exactly it is you're planning to pull off — by which time you will have distracted them by completing the trick and amazing them. Now look away, and get ready to act your heart out! Check under the cup farthest away from you, but make a big show of it! The more convincingly you can sell this portion, the more distracted your audience will be. You can hover your hand over each of the three cups like Chris does, or make it look like you're thinking really intensely about how your victim's mind works and where they must have hidden the bill. 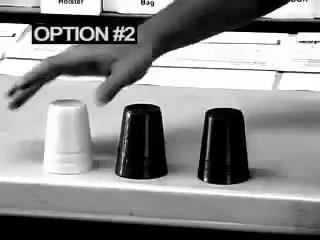 They will be less likely to ask questions during the trick (or at the end) about whether or not they saw both sides of the bill, or about how you cheated, if they're too busy trying to keep track of whether you're "getting vibes" from a cup, or how you possibly be using logic to deduce where they hid the bill. Try to go for what comes naturally to you. If you can play at being either a mystic or a standup, then test the vibes from the cups and play it trance-like or silly respectively. If you're the serious sort, then maybe pretend like you're thinking out loud as you work out where your victim hid the bill. If the bill is under the first cup, then react with pride, basking in every last bit of your newfound mind-reading glory. You want to make it seem as if you had told the audience that you would find the bill on your first attempt (if you've been following this how-to, you should have told them no such thing). But, if the bill isn't there, you can't afford to break your stride — you need to make it seem like you knew that all along. You can either move right on to the next step, unfazed, or you can sarcastically exaggerate how surprised you are that the bill wasn't there. This is one of the most important steps in the trick. Move the cup you just checked past the other two cups, such that it's now the cup nearest to you. Make sure all three are still arranged in a clear line. You need to do this subtly as if there's nothing attention-worthy or intentional about the fact that you just moved the cup to where it is. You need it to seem like you were just trying to get it out of the way because it was empty. Pick up the cup that's now furthest away from you. If the dollar bill is underneath it, pick up the cup that you just moved and put it back in its same spot from before. This will emphasize to your audience that the bill was under the middle cup. You can ask your victim to open up the dollar bill and examine it, and your audience will think the message that you wrote on the bill magically appeared during the course of the trick. They should also be amazed that the writing on the text is accurate, but feel free to remind them — you have supernatural powers, no need to be shy! 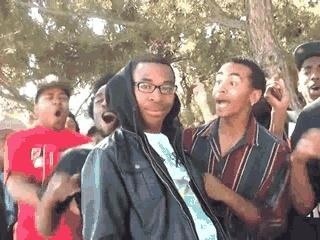 But, if the bill wasn't under the second cup you checked, again, make it seem like you planned that. As before, exaggerate your disbelief that it wasn't there, or move on nonplussed. Your call. This time, however, leave the cup where it is after checking it. Step 8: Deliver the Prestige! All that should be left to do now is reveal the prophecy-laden bill hidden under the last cup to your audience, which hasn't registered that you've moved the original first cup to the opposite end — if you've played your cards right so far (mixing your metaphors will definitely help you misdirect your audience). That cup should, by now, be the middle cup, and therefore fulfill everything you've written on the dollar bill. If you've made it this far and slipped the cup-switch past your audience, then congratulations, and take a bow. You've earned it! If you want a quick reference to see all those steps in action, Chris has helpfully provided a sped-up run-through of the whole trick! If you need to go over any steps in more detail, or if you just want to borrow some ideas from Chris about how to carry yourself during the trick, make sure to check out his video tutorial below. To keep your audience from figuring out your modus operandi, diversify! Now that you've got a mentalist's trick up your sleeve, why not follow it up with some sleight-of-hand and learn how to perform the "ordinary plastic bag" card trick?